Happy Halloween, college football fans! The Kickoff Games of the Week are Florida vs Georgia and Arizona at Washington. 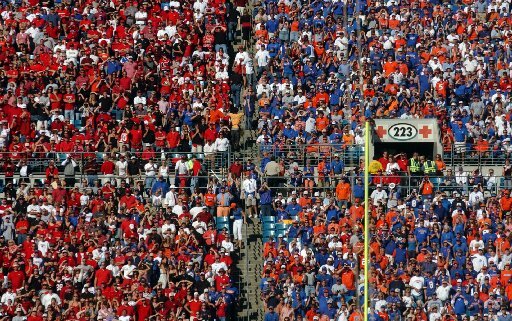 At the start of the season, it would have seemed more likely that the Bulldogs would dominate the Gators, but midway through the year, Florida is 6-1 and our No. 12 ranked team, Georgia is 5-2 and ranked at No. 24. AP has Florida ranked No. 11 while Georgia isn’t even in their Top 25. The Gators’ only loss is to undefeated LSU. That shouldn’t stop this rivalry game from being a slugfest, though, if Georgia’s defense steps up against Florida’s passing game. Nicknamed the “World’s Largest Outdoor Cocktail Party”, this one is always fun to watch. The fact that it is Halloween should make for some great fan theatrics anyway. They meet up at 3:30 pm today at EverBank Field in Jacksonville. The game is on CBS. Arizona and Washington kickoff at 11 pm Eastern in Husky Stadium in Seattle. The game is televised on FOXS1. A win tonight keeps both the Huskies (3-4) and the Wildcats (5-3) in position for a bowl game. A loss means crunch time down the stretch. Washington leads the series 19-11-1, but we’re picking Arizona to win it. In The Kickoff Top 25, LSU was our new No. 1 team in the country this week. The Tigers do not play this week. In this week’s issue, The Kickoff provided a conference breakdown through issue 9 and looked at the past decade of how our pre-season picks performed at the end of each season. We also made our Playoff Predictions with the Top 4 Seeds and First 4 out, analyzed the strength of schedule, included News and Notes, and, of course, offered up our weekly Power Ratings comparing the this week’s matchups. We’ll have a brand new issue out Monday with a look at how the games went today. Test your knowledge of college football by participating in our Thursday Throwdown trivia. This week we asked which conference ended the 1989 season with 3 teams ranked in the Top 10 of the AP Poll and listed as conference co-champions. AP-ranked #5 Tennessee, #6 Auburn and #9 Alabama were conference co-champions with conference records of 6-1-0 in 1989. The Vols finished that season 11-1, while the Alabama teams both finished 10-2 (Auburn beating the Tide 30-20 in Bama’s first-ever visit to the Plains). Also that season, Miami (also 11-1) won its third national championship of the decade.